Safe and Sturdy Design: lightweight, compact and easily portable. Fits in the palm of your hand and perfect for travel. Hidden blue LED power indicator. Contains internal protection mechanisms. Did you know that not all chargers charge a device equally fast? 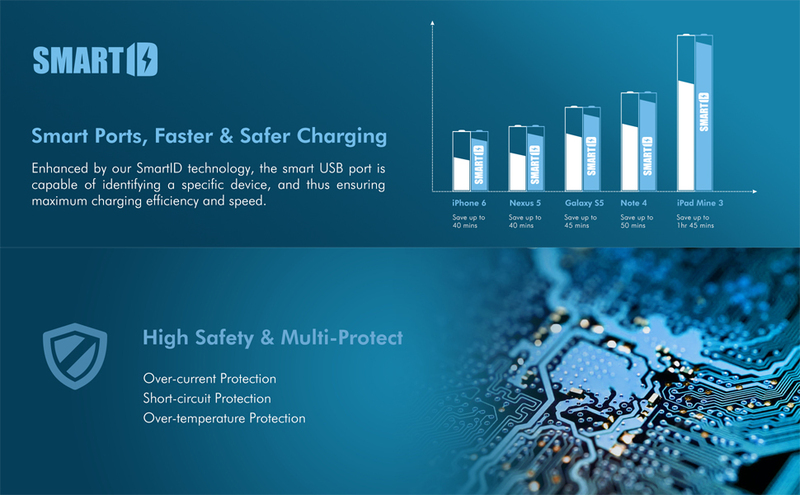 Enhanced by our SmartID technology, the smart USB port is capable of identifying a specific device, and thus ensuring maximum charging efficiency and speed. With SmartID, our charger "knows" your device and charges at the maximum speed. - Pumps out 36W watts of power via 3 ports, enough to charge simultaneously 3 iPad at full speed. - 2.64 x 2.09 x 1.12 inches size with foldable plug, most compact in the best-selling market. Worldwide AC100-240V input is ideal for international travel.